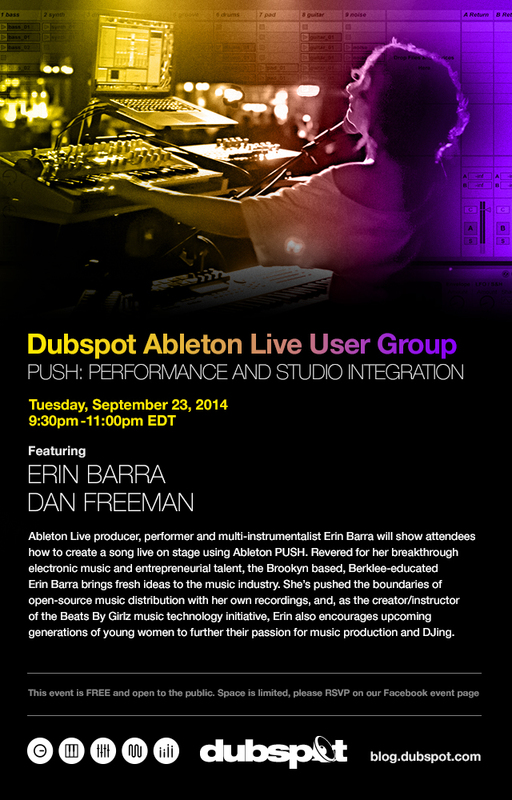 Our Dubspot Ableton User Group continues on Tuesday, September 23rd with a live performance demonstration by Erin Barra and Dan Freeman. Ableton Live producer, performer and multi-instrumentalist Erin Barra will show attendees how to create a song live on stage using Ableton PUSH. Revered for her breakthrough electronic music and entrepreneurial talent, the Brookyn based, Berklee-educated Erin Barra brings fresh ideas to the music industry. She’s pushed the boundaries of open-source music distribution with her own recordings, and, as the creator/instructor of the Beats By Girlz music technology initiative, Erin also encourages upcoming generations of young women to further their passion for music production and DJing. « Dubspot DJ Tutorial – Cue Points + Scratching Technique w/ DJ Shiftee!